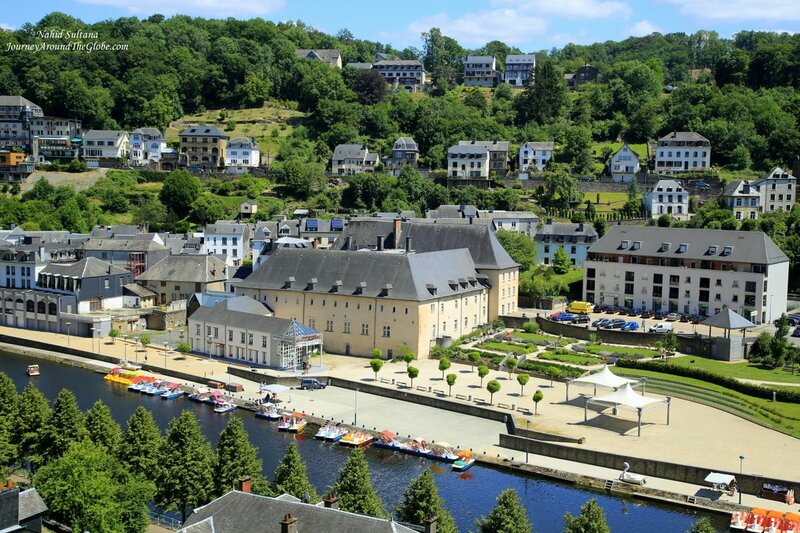 BOUILLON, BELGIUM: Bouillon is the city of Godfrey, a legendary knight of the first crusade from 11th century (remember him from the movie “Kingdom of Heaven”?). This is the “Jewel of the Semois Valley” and a paradise for gourmets, nature lovers, and history enthusiasts. TIME of TRAVEL: As we are preparing ourselves to leave Belgium in just a few weeks, we are making good use of every weekend and holiday. 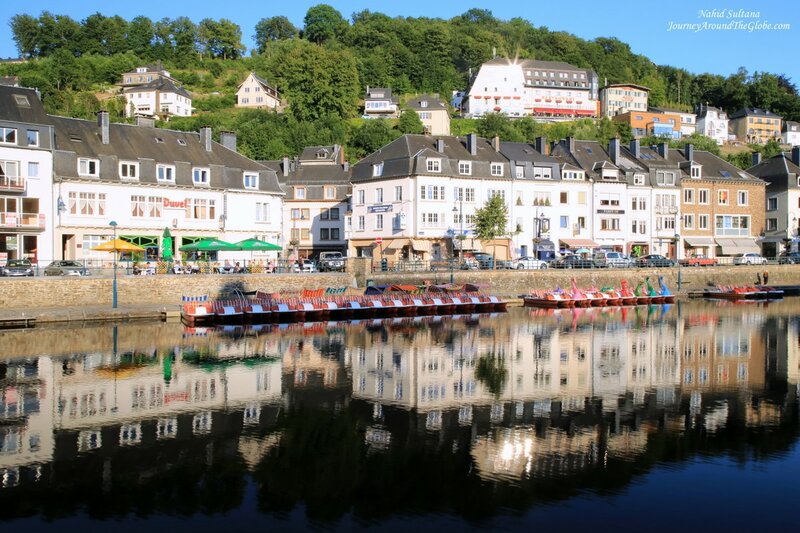 Last week, on the 3rd Saturday of June 2014, we took a day-trip to Bouillon. It’s about 1 ½ hours of drive from Tervuren, Belgium, may be same time if you are driving from Brussels too. EATING and SHOPPING: We had lunch at Pizza Hut in a service-inn on our way to Bouillon. We had some home-made gourmet ice-cream after we visited the castle and came down to the valley. And for dinner we sat down in a small restaurant on a small alley parallel to River Semois. Since we are big fans of FIFA World Cup, the restaurant “La Grignotte” were showing Argentina vs Iran match, so we decided to take a table there. It looked like the place is very well-known for their burgers and different kinds of sauces to eat with your burgers and fries. But they also had salad, pasta, sandwich, waffle, crepe, and omelets. 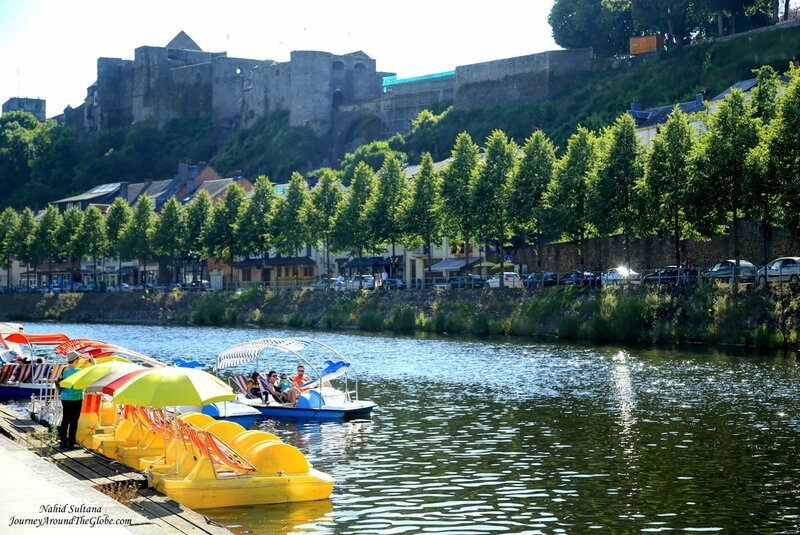 But if you want to have your meal by the river-side, Bouillon has plenty of options for that too. There were countless big and small eateries by the river and they were all overcrowded with relaxers and chillers. Pick a place from there and enjoy a lazy meal or a drink by the water. As for souvenirs or shopping, we didn’t see many shops along the riverside. May be the shopping streets were hiding in the more inner part of the city. However, we did see a tobacco shop where they were selling post-cards, shot-glasses, and other small things. PLACES WE’VE VISITED: We reached Bouillon right after lunch, around 2pm. Since these summer days are longer, we were able to spend a good few hours here. 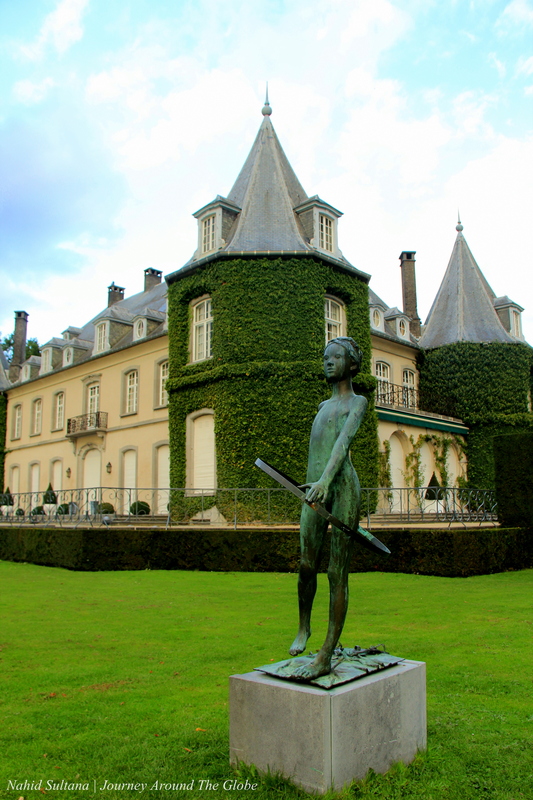 1) CHATEAU de GODEFRIOD de BOUILLON: This is the main attraction of Bouillon. Godfrey of Bouillon was one of the heroic knights of the very first crusade from the 11th century and His castle (from the 11th century too) in Bouillon is a major asset and a historic landmark in whole Belgium. The castle is also probably one of the best places to get some thrilling views of Semois Valley, the river, and town below. 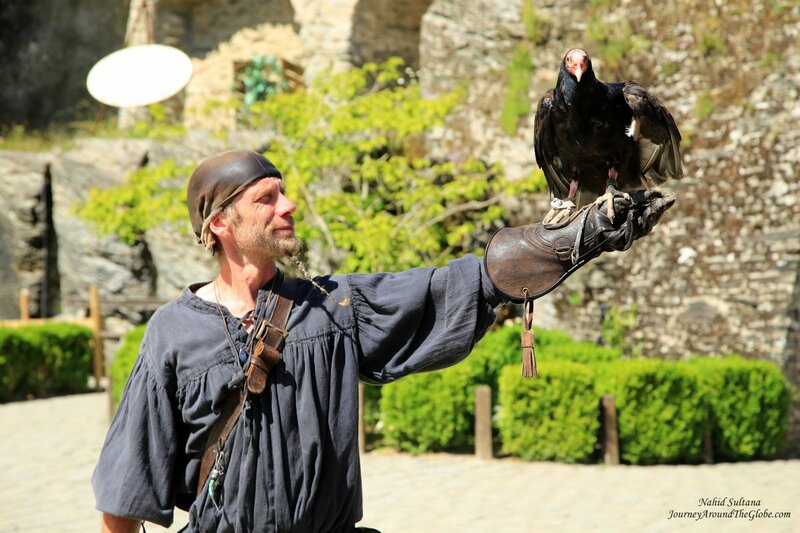 We went thru two old tunnels “Pont a Bascule” and “Pont Levis” to come to the main front yard of the château where “Falcone Show” takes place few times a day. This was very exciting for our girls. The show was for half an hour and displayed all sorts of birds of prey. Two hosts were speaking mainly in French and Dutch, so we couldn’t really get the jokes, but really enjoyed the birds’ performance. Godfrey’s Chateau has a huge complex of medieval defense with old walls and stone buildings. All the accessible spots are marked with numbers. 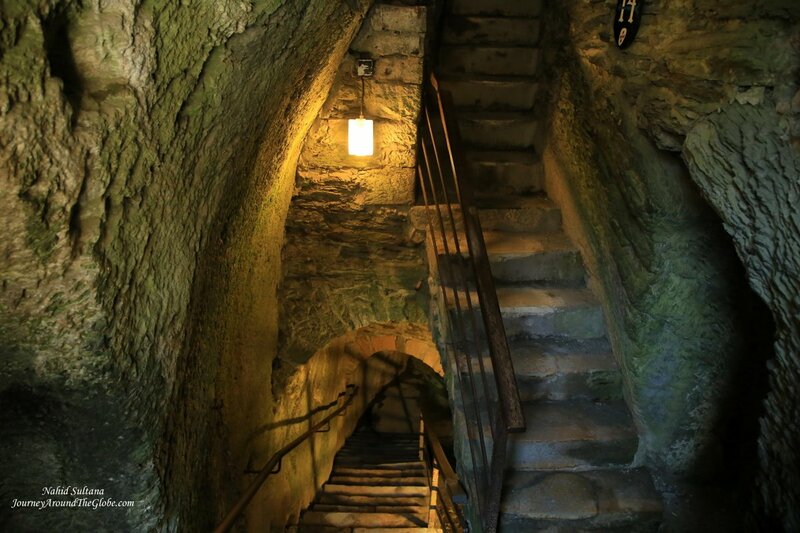 There are many underground tunnels that you can explore here with countless stairs going up or down. 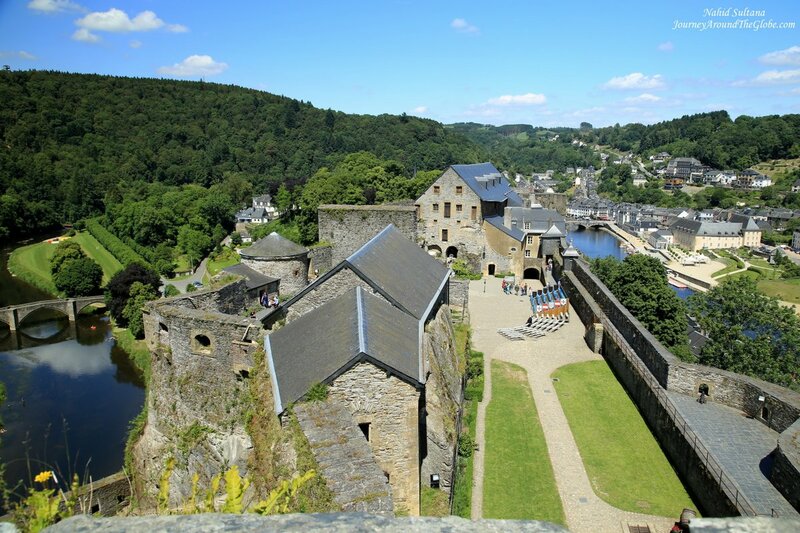 Visiting this castle was the most enriching travel through time of crusades in Bouillon. This is one of the oldest and most interesting feudal castles from that era. Visitors follow the footsteps of the crusaders in this castle…a bewitching place of walks and discoveries. There were some small exhibitions all around the castle. You can even see a medieval torture chamber and an underground prison. Most of the information inside the castle complex is written either in French or Dutch, so I would highly recommend getting an audio-tour. We brought our car to the small hill the castle is on and drove back to the city center after we were done with the castle. There are many parking spots both near the castle and down in the valley. Ticket is 6.50 euros per adult and 4.50 euros for kids. Audio tour is available at extra fee. 2) WALK by RIVER SEMOIS: After we came down to the valley and near the river, we parked the car, and began walking by River Semois. We started from one side, crossed a small bridge, and reached another longer bridge on the other side. We had river on left side and lots and lots of restaurants on our right side. It was simply relaxing looking at the small paddling boats on the river, expressive buildings, and people the cafes having good time. 3) PADDLE BOAT on RIVER SEMOIS: Looking at other people paddling on River Semois, my elder daughter wanted to give it a go. We rode on camels in Giza, rode on donkeys in Petra, did plenty of horse-wagon rides, boat tours, cruising, and stuff…but never tried a paddle boat. So why not? It was a lazy late afternoon and we really had nothing else planned out to see or do. We crossed the small bridge to the other side of the river and rented a small shaded boat to explore pleasant River Semois. Boat is 3 euros per person for 30 minutes ride and 5 euros for an hour ride. It closes at 7pm in summer. We took a 30 minutes ride and it was enough to go around the river on one side by the old buildings, restaurants, and hotels. 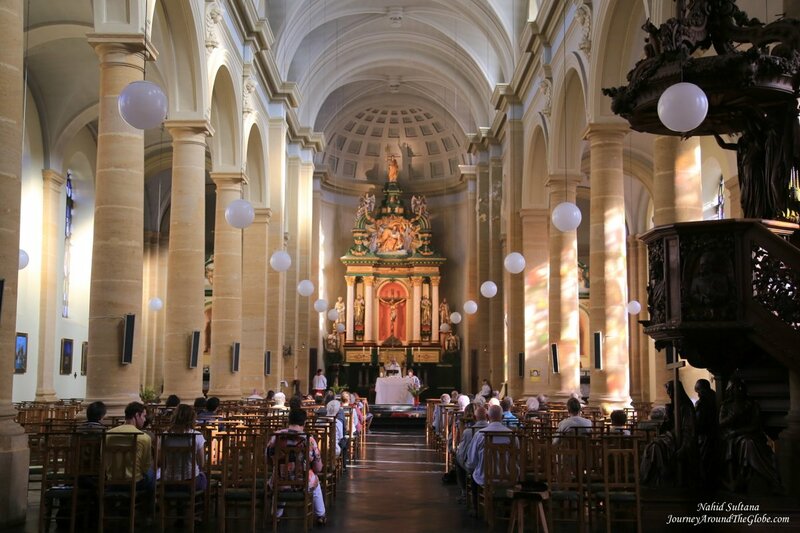 4) UNKNOWN CHURCH: One of the famous churches of Bouillon is Basilique de St. Hubert. We didn’t visit that one, but we found another one that’s steeple was raising high, dominating the old town of Bouillon, very close to River Semois. We couldn’t find the name of this church; tried searching its name in the web…but no luck. But it was a beautiful church outside and inside. There was a service going on when we arrive, so really couldn’t walk around to its dazzling altar that I saw from the entrance. 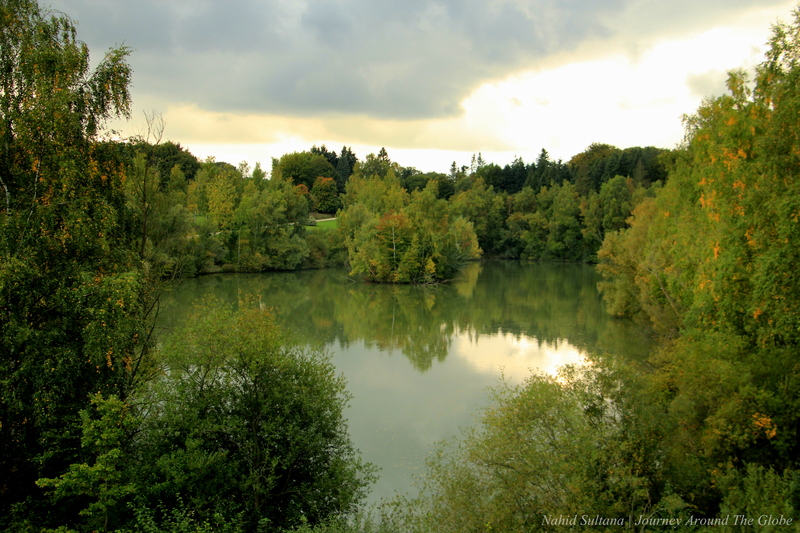 LA HULPE, BELGIUM: Belgium continues to surprise us with its history and natural beauties. 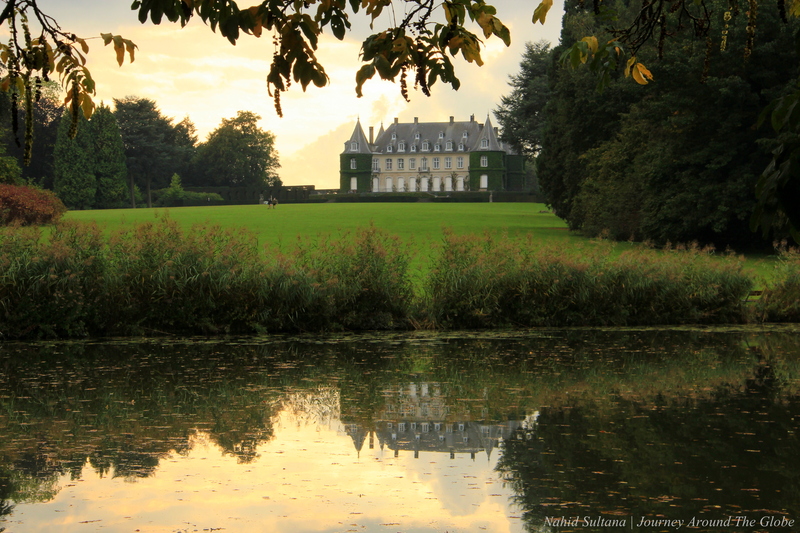 La Hulpe is one of those places where both nature and history come together in one splendid landscape. Since fall is almost here in Belgium, I wanted to get out of the house with my camera to shoot some fall colors in any nearby site. La Hulpe, a Walloon town (French territory of Belgium), is only 10 miles from Tervuren. 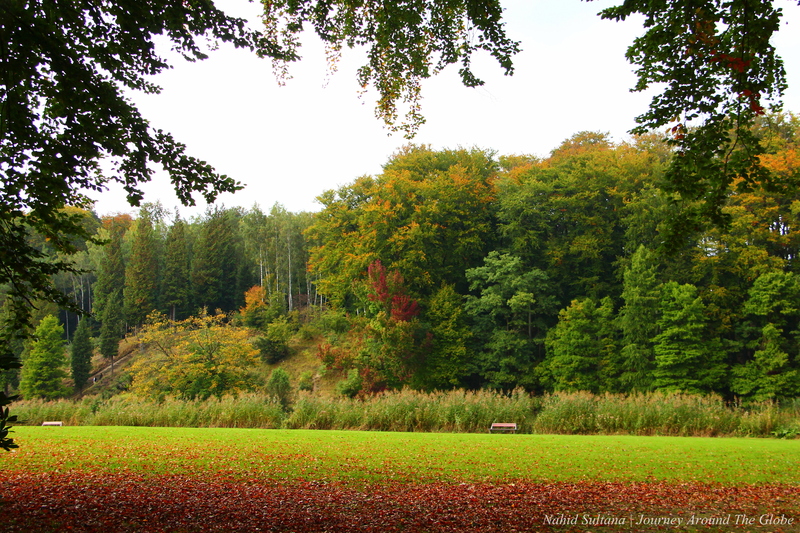 Park and trails of La Hulpe is part of Soignes Forest which is the biggest preserved forest in Belgium. I reached there around 5:30 pm, by then, the sunny harsh light was gone. Many children, especially scout teams, were there to do some nature walks and exploration activities. The park is huge, I mean it’s very big and will need few trips to cover at least the main natural sites. I didn’t really go into deep trails or forest on my first trip, just followed a paved path that led me to the Castle of La Hulpe. I am not sure if you can actually go inside the castle. But my daughter was saying they went inside during their trip here with school French instructor two years ago. But anyways, it was closed by the time I went there. There is a small but beautiful garden in one side of the castle and front of it is a big meadow. A lake awaits after you cross the neat green field of grass. It was just beautiful. I promised myself that I would come back here once again during the peak of fall and get some nice photos of patches of colors from the trees surrounding the lake. 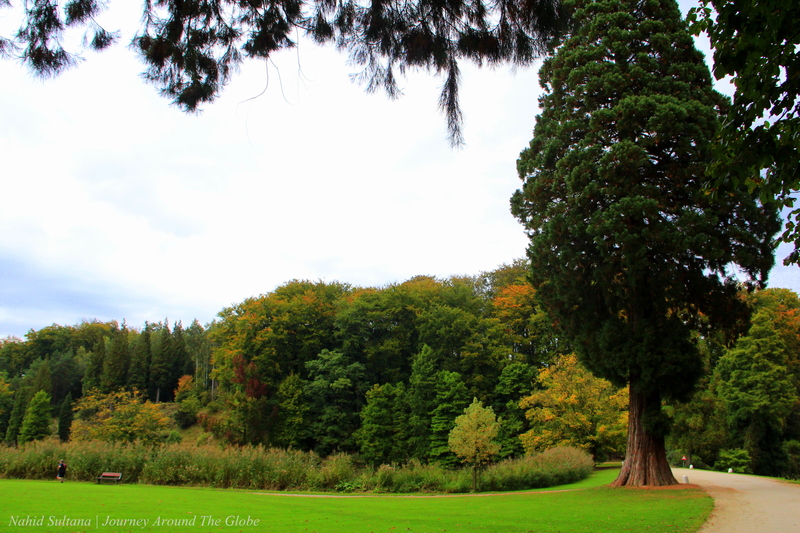 La Hulpe Park is a perfect place for joggers, runners, photographers, explorers, and people who just love nature. There was a little history board giving some info on the castle as well as Soignes Forest, but everything was in French…so really couldn’t figure out anything. 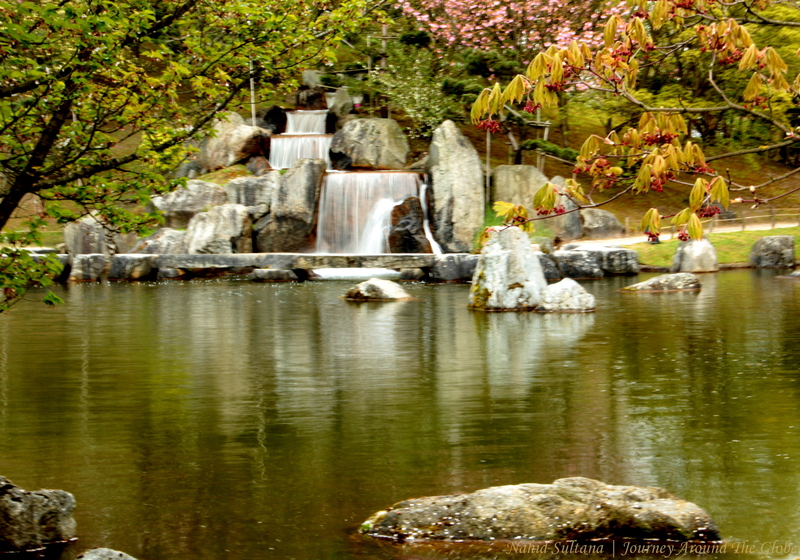 But overall it was worth spending 2 ½ hours here with my camera last Saturday…gotta come back again though. 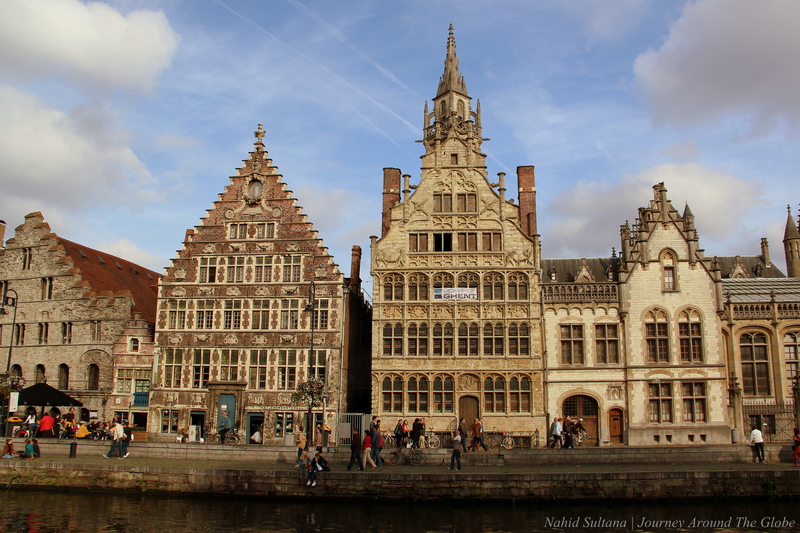 GENT, BELGIUM: Gent is a true gem of Belgium, a postcard city, and as magical as forget-me-nots. It’s a glamorous city with dozens of picture-perfect sites. It was one of the richest and most powerful cities in Europe during the Middle Ages. I know most of the people go to Brussels and Brugge when visiting Belgium. But if you visit Gent, you would say Brugge is just OK…seriously, Gent has hundreds of tourists but it’s not as commercialized as Brugge or Brussels. 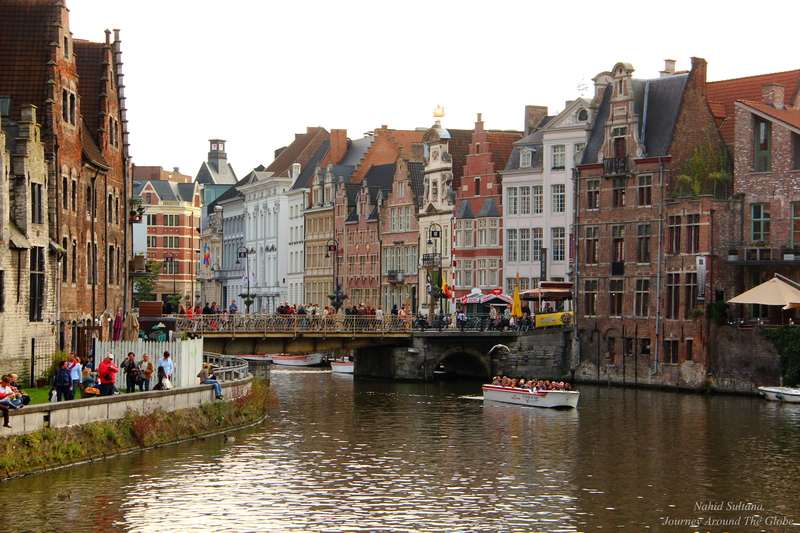 Gent is less than an hour drive from Brussels. You can make a quick day trip from the capial, but I would highly recommend to stay one night if you want to visit all the beautiful churches, do some shopping, admire medieval history, and etc. This is an old city with modern touch. If you have an extra day while you are in Europe (Brussels to be exact), don’t miss this opportunity to visit Gent. If I have to compare Gent with Brugge, I would say Gent has a lot more scenic places to offer than Brugge. 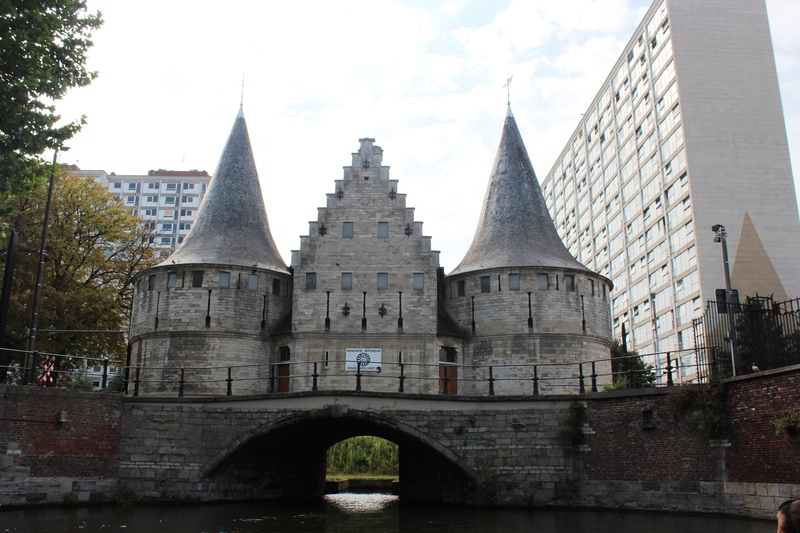 TIME of TRAVEL: First time we drove to Gent from Tervuren was on a nice Sunday afternoon on August 21, 2011. The weather was amazingly nice. But couldn’t really accomplish much except for taking a boat tour. But the second time we were there was with a family visiting us from Portland in September of 2013. We reached there early and had whole day to enjoy the best city of Belgium…yes, after my second visit to Gent…I declare this to be the best city of Belgium (of course in my opinion, Brugge comes after Gent). 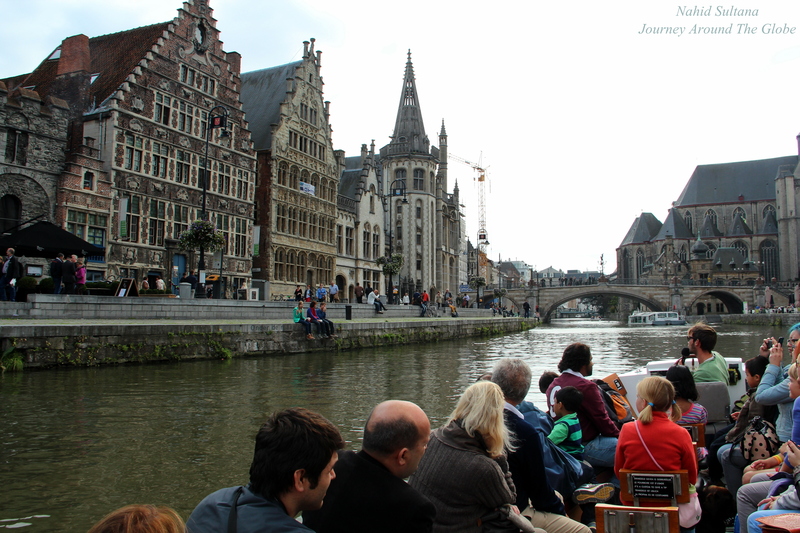 PLACES WE’VE VISITED: Boat ride thru the canal or taking a walk in the old city…both are fantastic way to enjoy Gent and we did both. Boat ride costs 6.50 euros per person and they have English tour as well as Dutch, French, German, Italian, and Spanish. You will get a lot more interesting history of the city from the commentary of captain. All the main attractions are within walking distance and enjoyable. Inhale all the beauty Gent has to offer and relax; but keep your eyes open…don’t want to miss any beauty here. 1) THE GRASLEI: This once used to be known as the most beautiful street in Europe which was a wheat trading center. Every house on the Graslei, on both sides of the canal, has its own history. The Roman style Guild houses there dates from 1200. There are some nice outdoor restaurants and boutique shops to spend some quality time with your friends and family. 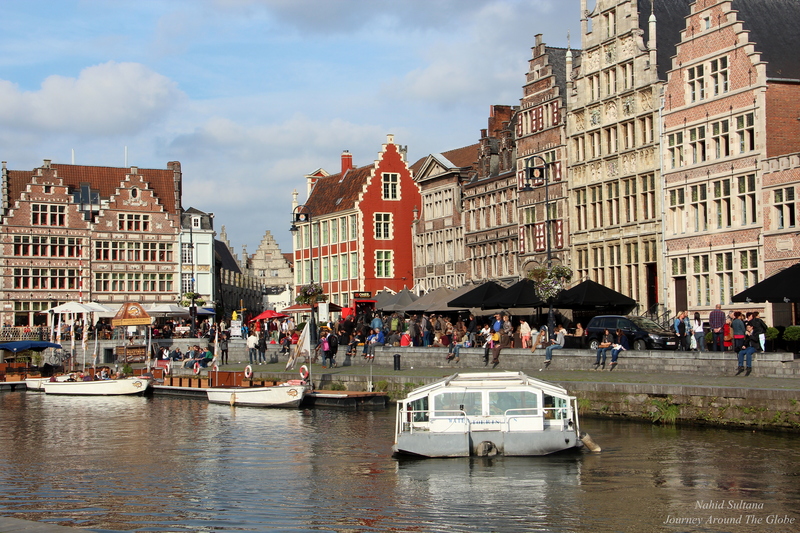 Together they form the story of the incredible blossoming of Gent’s economy during the Middle Ages. Today the activity is completely different: cheerful voices, talking, and laughing. 2) BELFRY: You can see these belfries in many Flanders cities, like Brugge. This belfry is one of the “three towers of Gent” in the city’s skyline. 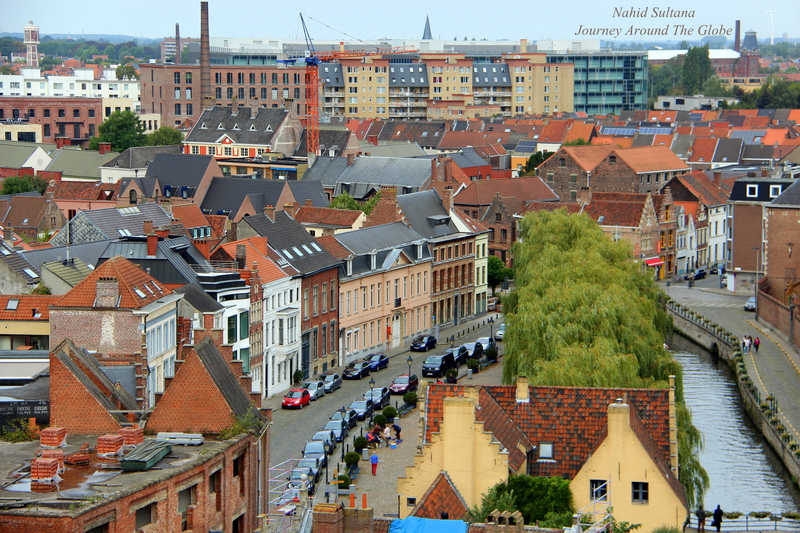 (two others are spire of St. Bavo‘s Cathedral and spire of St. Nicholas Church). It was built in 1313 and designated it as the city’s proudest symbol of independence. 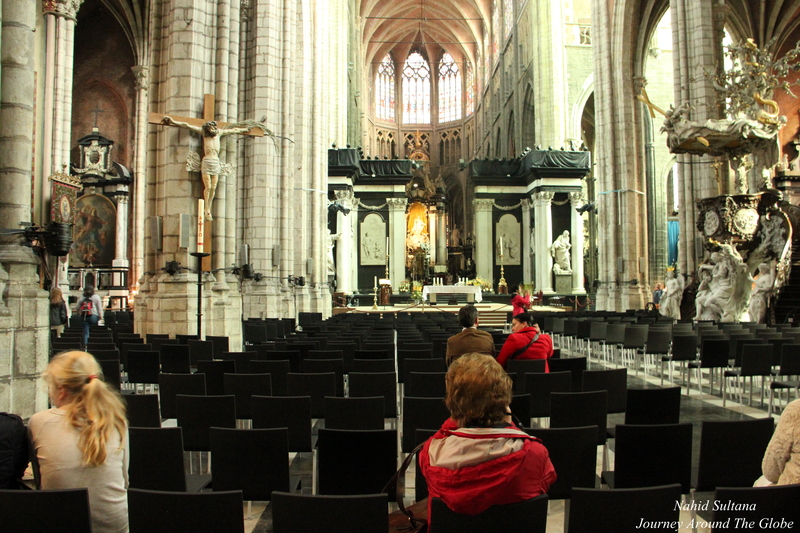 This is a UNESCO World Heritage Sites, like all the other ones in Belgium. We didn’t do it, but tourists can take elevator to go to the upper gallery to see the bells and an amazing 360 degree view. Adjacent to Belfry is the Brabant Gothic style building known as The Cloth Halls from 1425 AD and corner of it is an old jailer’s home and a prison. 3) ST. BAVO’S CATHEDRAL: Beside the belfry isThis is one of the most beautiful and historic landmark of Gent. This one and all other medieval architectures of churches here are remarkably well-preserved and restored. Make sure to inside those churches to appreciate their beauty inside and out. 4) ST. NICHOLAS CHURCH or SINT-NIKLAASKERK: This 15th century church was built in typical Flemish architectural style. Inside the church may not be as grand as the cathedral above, but both have similar black and white theme. It’s alter is very beautiful and so is the organ. Those strong stone columns and old statues will take you back to medieval ages in no time. The church is open every from 10 – 5 pm and closed on Mondays. Entry is free for everyone. 5) ST. MICHAEL’S CHURCH or SINT-MICHIELSKERK: This is also a very nice and historic church of Gent. It’s very close to the old post office and Graslei and has bold exterior architecture that you can’t miss. There is no fee, so why not check it out? It’s open everyday from 2 – 5 pm from April 1st to September 30. I guess, other time of the year, it’s closed for visitors. 6) THE RABOT: With its two round towers, this was a sluice gate back in the medieval age. This was our last attraction of the boat ride. 7) COUNTS CASTLE or GRAVENSTEEN: This was the counts’ castle which was built in 1180 by Philip of Alsace. The keep, turrets, and different gates were built imposingly for defensive purposes. Later it evolved from count’s residence to a cotton-spinning mill, to the Seat of the Council of Flanders, and now to a tourist attraction. Travel back in the time to the Middle ages and explore more than 1000 years of history in this very well-preserved and well-maintained castle. Make sure to visit all 15 stations inside the castle wall. Go up the stairs to enjoy the magical 360 degree view of the city from very top of the keep. Those torture instruments that witnessed gruesome and horrible medieval jurisdiction are some of the rarest in all of Flanders. Banquet Hall and Dungeon were remarkable too. 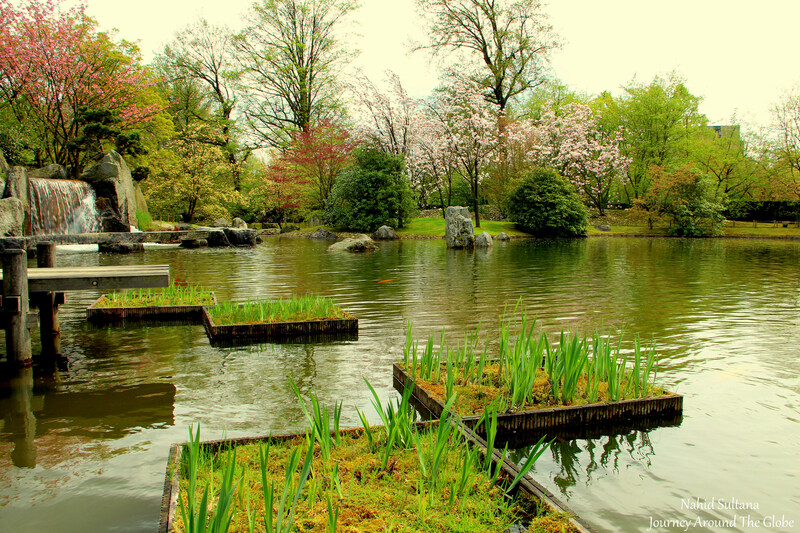 HASSELT JAPANESE GARDEN: Hasselt Japanese Garden is a little piece of Japan in Belgium. 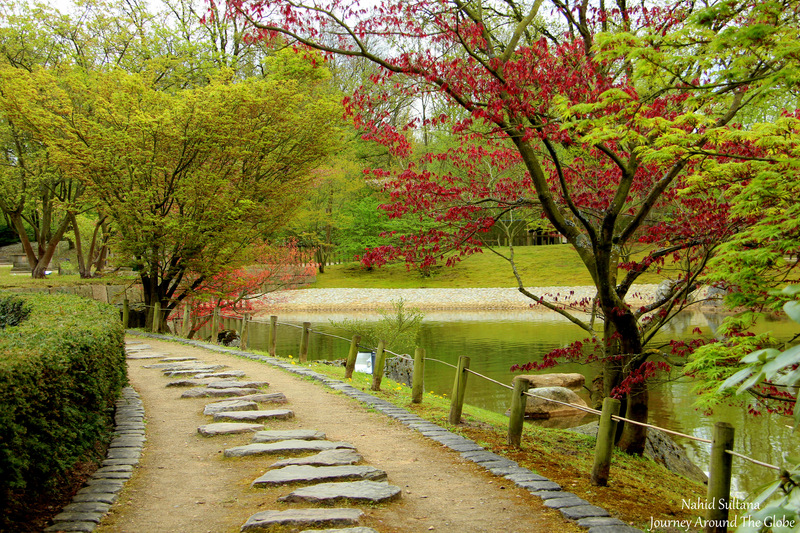 This is a miniature version of the real natural beauty reconstructed the way Japanese have been doing for centuries. 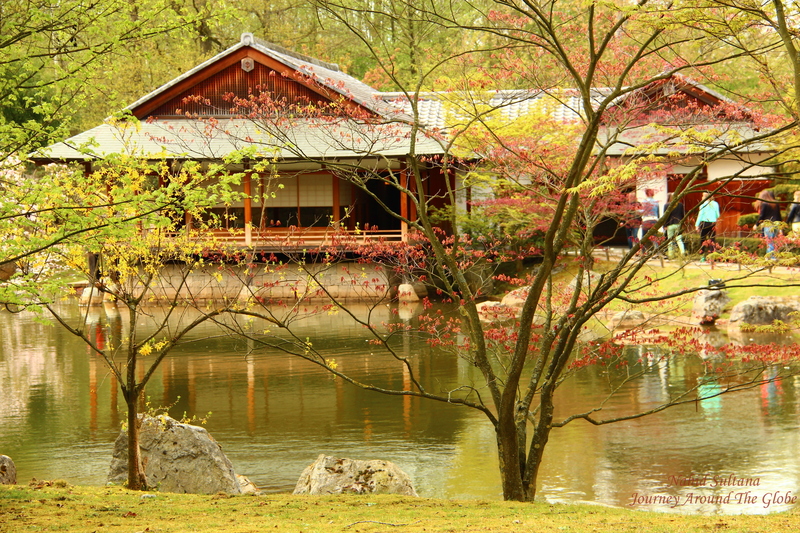 This is a must-see spot in Hasselt since it’s the biggest Japanese garden in Western Europe. Built about 20 years ago, the art of landscaping of this imperial garden depicts calm mountain scenery, with soothing sound of river, and view of rocks. 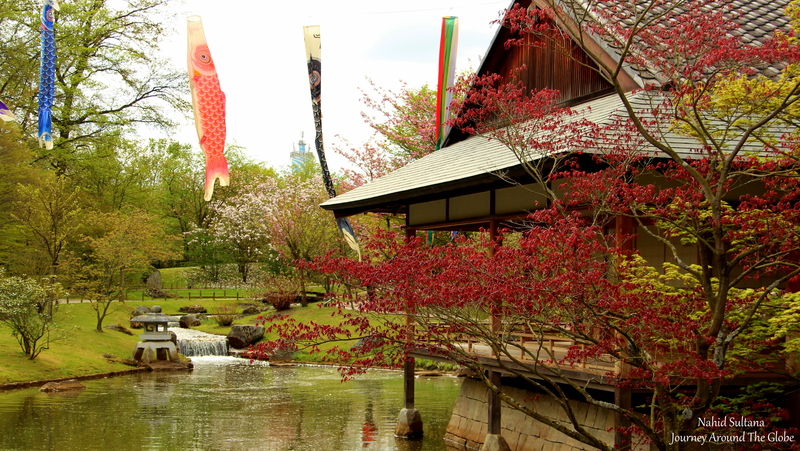 Japanese style house, cherry blossoms, a Shinto temple, water-falls, and clear water are just some ideal things to give its visitors some inner peace and tranquility. Entry fee to the garden is 5 euros per person (kids 12 years and below are free). The park is open from 2 – 6pm during the summer time. Couple hours inside the park is sufficient. We didn’t find any place to have lunch (thank god we brought sandwiches with us that day) but you can find tea and some snacks in the center of the park, just follow the sign. DINANT, BELGIUM: Belgium never stops surprising us with its coolness and charming little towns. 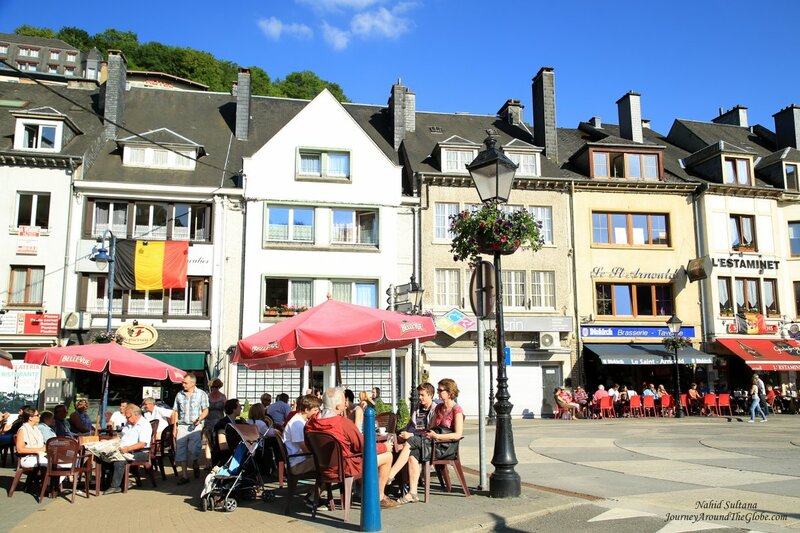 Situated by River Meuse, Dinant is a French-speaking (Wallonia) part of Belgium in Province de Namur. 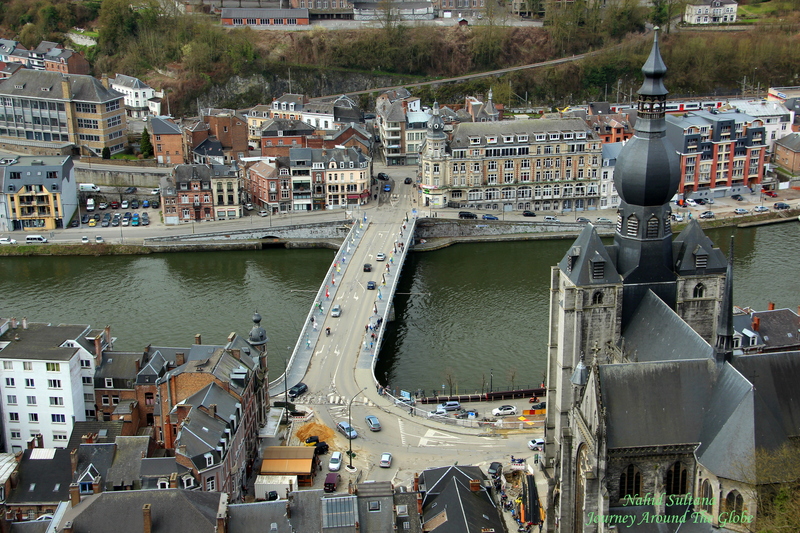 The name for the town of Dinant was first recorded about 800 BC. The first bridge of this town was built around 1080 AD. In those old days, Dinant’s main activity was to manufacture copper. 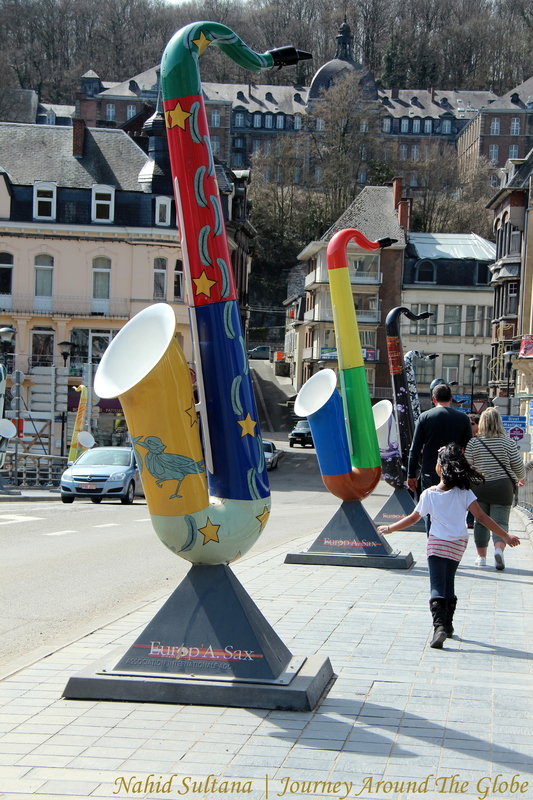 Interestingly, Dinant is home town of Adolphe Sax, the famous Belgian musician who invented saxophone. 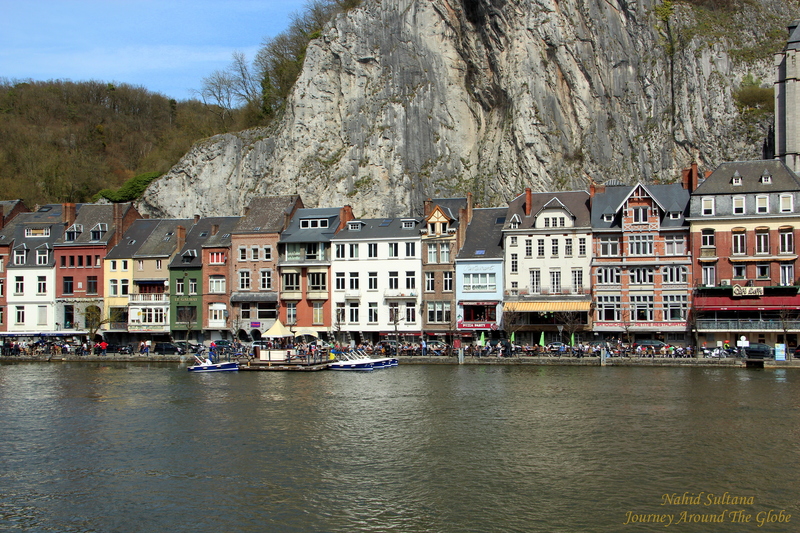 Dinant would be a perfect place for a day-trip from Brussels or other cities of Belgium. We didn’t take river cruise on Meuse, but saw some boats and water-taxis for visitors to hop on for a lovely tour around the river. 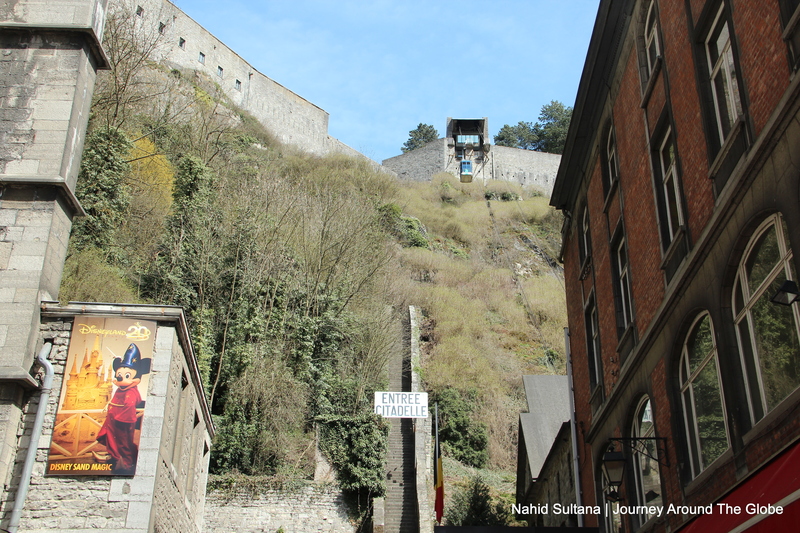 TIME of TRAVEL: It was a bright and sunny Sunday of April, 2013 when we visited Dinant. My uncle-in-law from Chicago was here visiting us. The day turned out to be a fantastic one for exploring. After Dinant, we went to Durbuy (another Wallon city in Belgium close to Dinant) for the latter half. 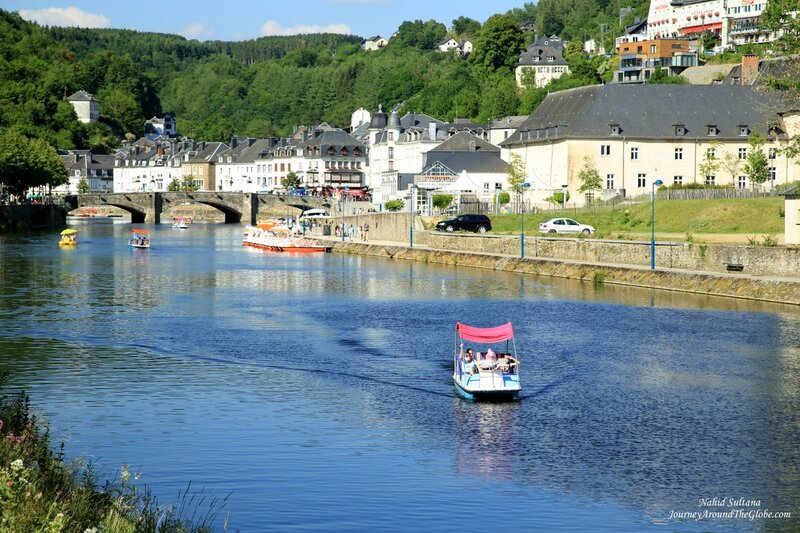 EATING and SHOPPING: There are many big and small restaurants and cafes by River Meuse. You can enjoy good food with good view near the Saxophone Bridge (not sure if this is the actual name of the bridge). We had some quickies in a fast food type small place. I didn’t see too many souvenir shops here, may be one or two by the river side and one inside Dinant Citadel. I am sure if you explore small streets, you can find some specialty places. 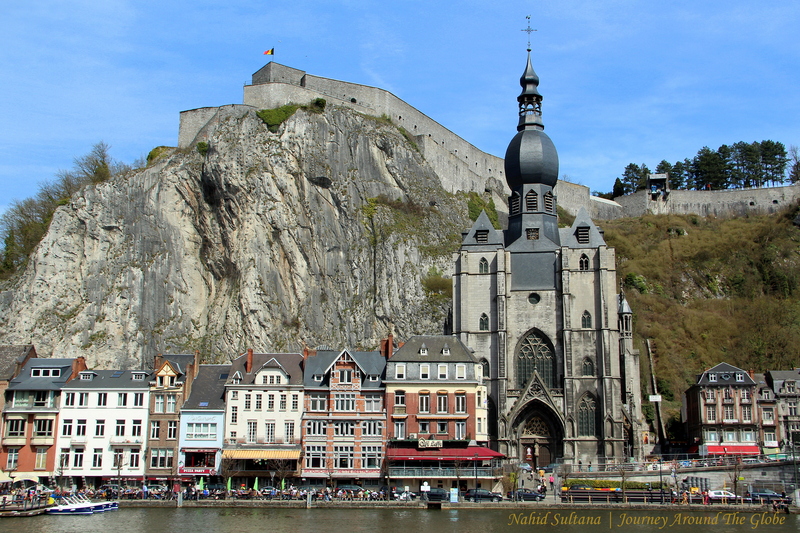 PLACES WE’VE VISITED: We spent few hours in Dinant. Walking around the citadel, then taking cable car down to the lower city, and strolling by River Meuse were fantastic. Small cities like these may not have world-famous tourist spots but the charm they cultivate is something you can’t find in big cities. 1) DINANT CITADEL: Visiting Dinant Citadel is like visiting many centuries of history. The first fortress was built at its current spot towards 1040 AD. 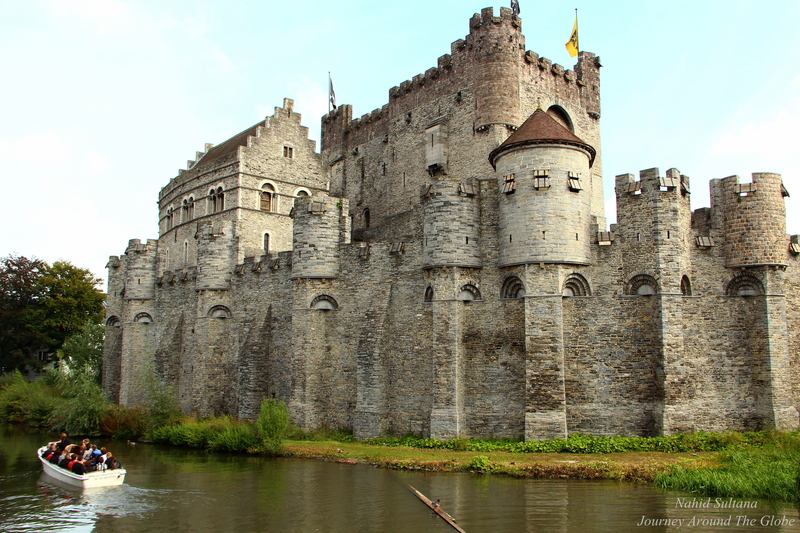 This fortress was erected between 1818 and 1821 under the Dutch regime. 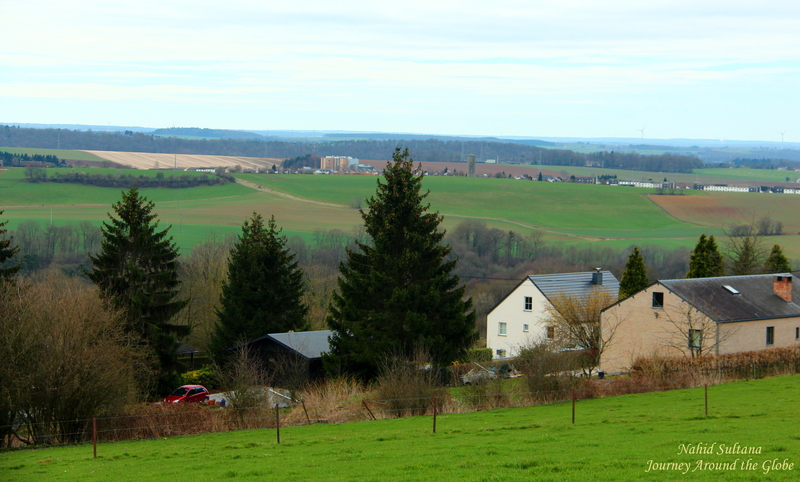 It once used to dominate the Meuse Valley from a height of 100 meters. The stairway of 408 steps to connect the citadel with lower town was constructed in 1577 and the cable car was installed in 1954. 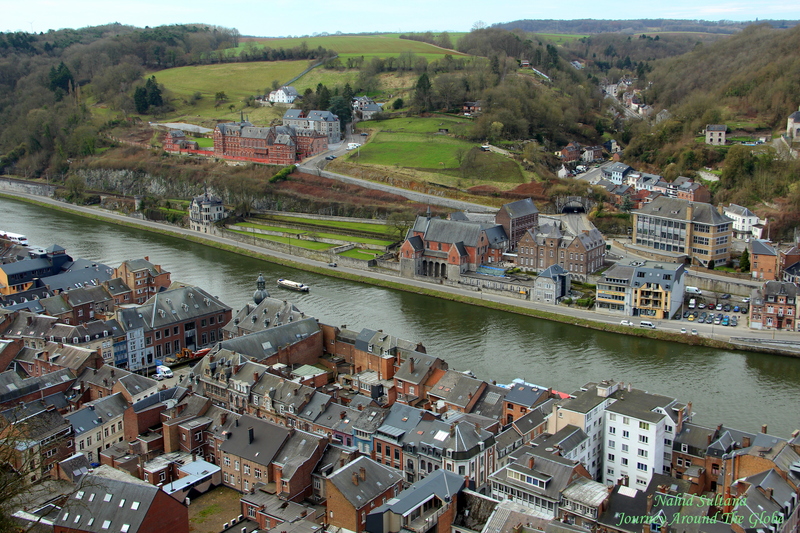 Dinant Citadel gives a splendid view of the city and River Meuse from up above. You can see the French border only 12 km away and famous Bayard Cliff on your left from the view-point of this fortress. The massive defense wall can be seen from far away and lower part of the city. There are many small galleries and museums depicting life in 1820, prisoners’ cells, torture room, armory, and a collapsed shelter cave/trench from 1914. This is like a big park great for strolling and wandering around while discovering old history. Looking at those century-old walls take you back in time when Dinant used to be a tiny city. 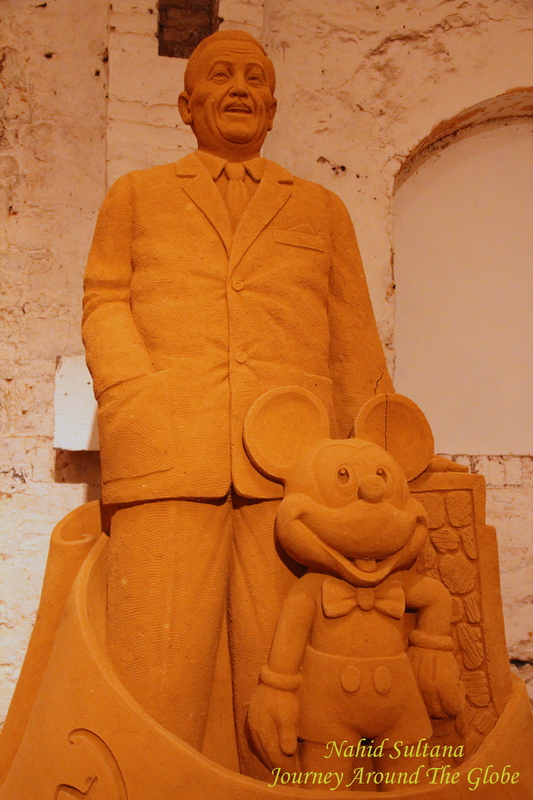 An underground temporary exhibition, Disney Sand Magic, was at display inside the citadel during our visit. We got to see many sand sculptures of famous Disney characters and castles from the movies and TV shows. It took us about 15-20 minutes to see few rooms full of these sculptures in an underground space of the citadel. Citadel + cable car + Disney Sand Magic cost 11 euros per person and 9 euros per kid. There is a free parking for citadel visitors on the hill. The citadel is open from 10 – 5 (10 – 6 during high season). There is a small snack and souvenir shop in the main courtyard of this fortress. 2) COLLEGGIATE CATEHDRAL: Located at the foothill of Dinant Citadel, this beautiful cathedral is a unique signature and landmark of the city. Visitor’s shouldn’t miss the chance of going inside to see its gorgeous interior (also because it’s free). Decorative altar, giant stone columns, and stained-glass windows are very nice. Cross the saxophone bridge and go on the other side of the river to get a prettier outlook of the cathedral. 3) SAXOPHONE BRIDGE and RIVER MEUSE: I really don’t know the exact name of the bridge, but this is the closest one to Collegiate Cathedral. The bridge is dedicated to Charles de Gaulle who had been wounded there on 1914. I call it Saxophone Bridge because both sides of this bridge is decorated with many colorful and artistic saxophones. Once we were done with the citadel and visiting cathedral, we crossed the bridge and went to the other side of the river. Lines of old buildings by the river with the cathedral and fortress in the back look brilliant. 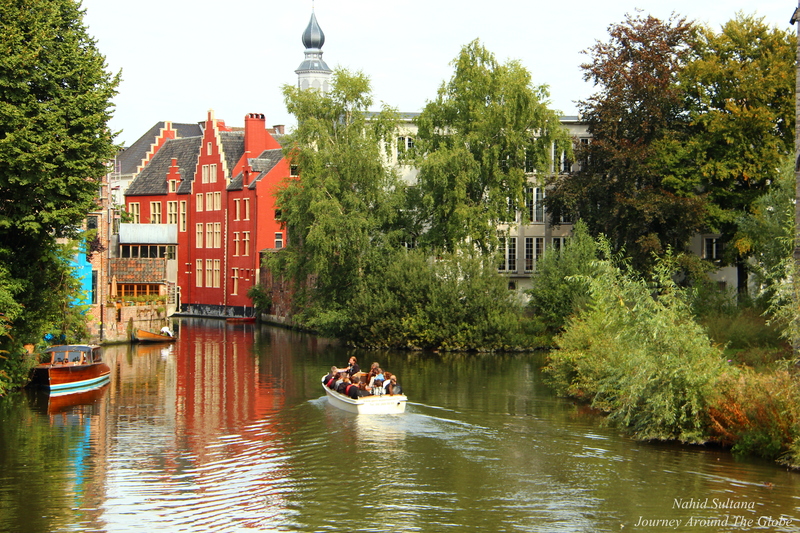 Take time to just walk by River Meuse while enjoying cozy old atmosphere of the city.